Happy Saturday, friends!! I hope you are enjoying the beautiful, crisp weather this weekend. I, on the other hand, am stuck inside at work today, looking at the sunshine from my window four stories up. Not my ideal weekend, but that’s just part of the job now and then. Something more exciting than working on Saturday – another delicious vegetarian delight, great for the lenten season! This poor wrap has been pushed around on my menu so much that I’m surprised it ever made it’s way to creation. And why this was the recipe that kept getting pushed from week to week is beyond me, other than it was always planned on a weekend, and I was always busy. It took me all of 6 minutes to make, seriously. I should have been pushing other things to save myself some time!! But, that’s ok…it was worth the wait and the timing was perfect for lent 🙂 See, everything happens for a reason y’all! Now, run in the kitchen and whip some of these bad boys up before you run out to enjoy the day! In a medium bowl, whisk together the vinegar, oil, chipotle chile and salt. Add the broccoli slaw and cilantro, and toss to combine. In another bowl, mash the beans and avocado together with a fork until smooth, then stir in the cheese. 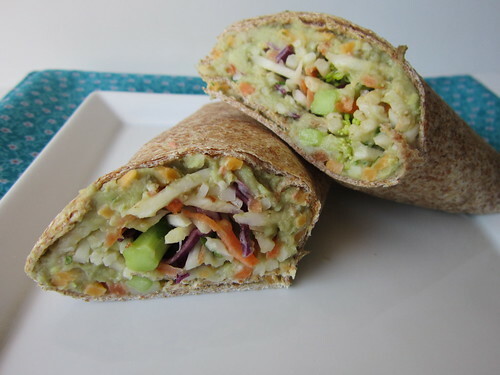 To assemble the wraps, spread about 1/2 cup of the bean-avocado mixture onto each tortilla, top with about 2/3 cup of the broccoli slaw, and roll it up. Cut in half, if desired, and enjoy!